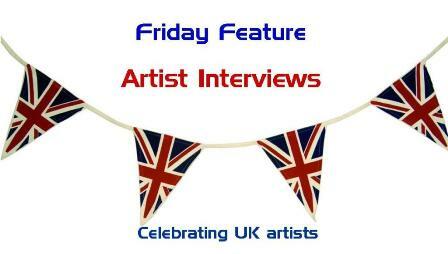 Welcome to the third interview celebrating the talents of British artists in the field of scrapbooking, photography, mixed-media, art journaling, feltmaking and quilting. Some names you may know and some may not be so familiar but they are all hugely talented. I’m Kate Crane, and I live in a rural village in the north of England with my husband, two children and many pets. 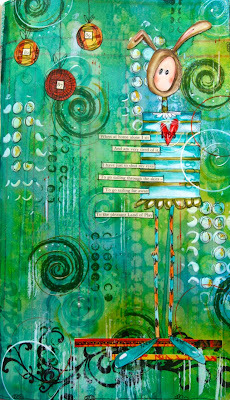 I’ve been crafting in one way or another all of my life, but in the last few years I have developed a real passion for mixed-media art, especially art journaling. I love bright colours and often use bold, vivid colours in my art. My art has been published in several publications in Europe and USA which has been a tremendous honour. I mix my real-life day job as a school teacher, with teaching as an arts and crafts instructor. I am proud to be on the Design Teams for Dylusions for Ranger and Stampotique originals; I love their products! Earlier this year I spent three fantastic days at Ranger Ink in New Jersey USA, to become a certified Ranger Educator. I’m a fairly frequent blogger and run an annual challenge on my blog to create and update an art calendar for a whole year; the challenge is now in its third year and still going strong. I have recorded several Art Journaling DVDs for Traplet Publications which are available internationally. Amongst my creative influences are Dyan Reavely and Dina Wakley, both artists who love to art journal and also have a passion for colour. They both have a wonderful loose and free approach to art journaling which is something I’d like to be better at! I also love to see what lesser-known artists are doing and regularly scour magazines such as Somerset Art Journaling by Stampington and co. as I’m always amazed and inspired by the fantastic quality of art on display. More recently the internet has been a great source of inspiration on social networking sites such as facebook and pinterest as people so generously share what they have been creating. This is a tough one to answer because I really like to use many different things. One of my loves is acrylic paint. I always loved painting as a child, and I loved to paint right throughout my school days. I can still picture the school art rooms vividly – they were my favourite place in school. Acrylic paints allow me to build up layer upon layer in my art, building the intensity of colour, and also allow me to create quite a grungy look. They are so versatile - you can use brushes, sponges, fingers, credit cards, brayers … anything to spread paint. They are also a very forgiving medium to work with because if you create a background you don’t like you can just paint over it again! I also love the unpredictability of ink sprays and the different effects you can create. I especially love splats and dribbles! I’m not sure, somehow things just evolved! 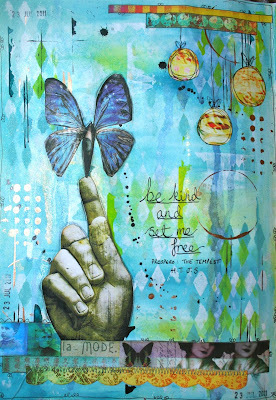 I actually started by making quite neat greetings cards, but then I discovered ATCs and gradually I got more and more adventurous and began to experiment with different mediums and techniques. I discovered a few on-line trading sites and I embraced the idea of sharing and trading art with others from all over the world. It is exciting to receive real and genuine art in the post from another artist and I was able to examine it closely to see how other people do things! I have always felt a strong pull towards bright colour and I rarely create anything neutral. I have taken a few art classes on-line and at Art from the Heart, picked up ideas and techniques from others, and then have given it my own twist. Other than that I am completely self-taught, but I’m not afraid to try something new, experiment and let things develop in their own way. If I ponder too long about what I’m going to make or do then I’ll just never get started, planning in my head just doesn’t work for me at all as I prefer to let things grow organically. I usually start with a background – once I get some colour on the page I’m off! Colour speaks to me. I don’t do vintage neutral, or shabby chic! Sometimes my ideas and/or choice of images can be a little off-the-wall or unusual. I just follow my intuitive thought process … but it’s not everyone’s cup of tea! (See above!) I have a passion for slightly weird or unsettling images such as freaky dolls. I like things to have a bit of an edge. I really like a slightly untidy, arty, grungy look. I think it’s a backlash against the neat cards and neat scrapbooking I used to do. I often forget about the importance of white space on a page, and instead build layer upon layer, using a combination of different mediums. ‘Spread your wings and fly’. I love the idea of this – that we all have potential – you just have to reach out and go for it. In reality of course, it’s quite hard to do. ‘Do I look like a freakin’ people person?’ (from a Stampotique stamp). This one really makes me laugh! ‘The meaning of life is to give life a meaning’. Of course! I loved the Twilight series and I’m not afraid to admit it! I’m also enjoying reading The Hunger games trilogy. Some of my favourite authors are Barbara Trapido, Ian Banks, Annie Proulx, Ian McEwan, Joanne Harris … but I’m also not averse to a bit of light reading in the shape of Jilly Cooper! I think my two favourite all-time books are Brother of the more famous Jake by Barbara Trapido, and The Shipping News by Annie Proulx. I also love art publications and have way too many but I can’t part with any of them. And books about photography of course! Go to Kate's blog for the opportunity to win her brand new DVDs - one set in European format and one set in US/Canada format. If you were able to ask Kate anything what would you ask? Please add your question to the comments below. See you next Friday for an interview with Sian Kibblewhite. great interview. i love your art kate!